Disney princesses are lucky to be the same age, so they are going to the graduation party together. 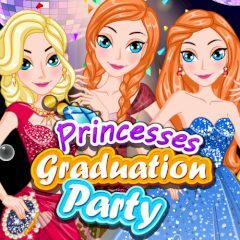 Dress each princess in the outfit, that would be better for her and meet all beauties together! A graduation party is one of the most important event for every teenager, but when it comes to Disney princesses, everything should be nothing, but perfect. There are three princesses, that will appear at the ball, so you have to make sure they look different. Choose an outfit for every princess and take a group photo in the end.